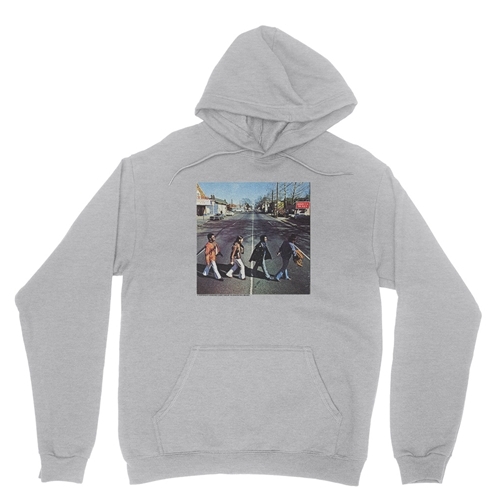 Officially Licensed Booker T and the MGs Mclemore Ave Hoodie Jacket. At the height of Beatlemania, The Beatles were so inspired by Stax Records that they conspired to land a helicopter on the roof to record at the Memphis studio before overzealous fans forced them to pull the plug. Then in 1970, the famed Stax house band Booker T and the MGs paid homage back to The Beatles with McLemore Ave, largely covers from Abbey Road, but soul'd out and funked up... Memphis style. Even the album cover, taken in front of Stax, of course on McLemore Ave, looks like Abbey Rd.